The Institute of the Brothers of the Christian Schools is a Catholic religious order of laymen whose mission is to provide spiritual and human education to the young, especially the poor. 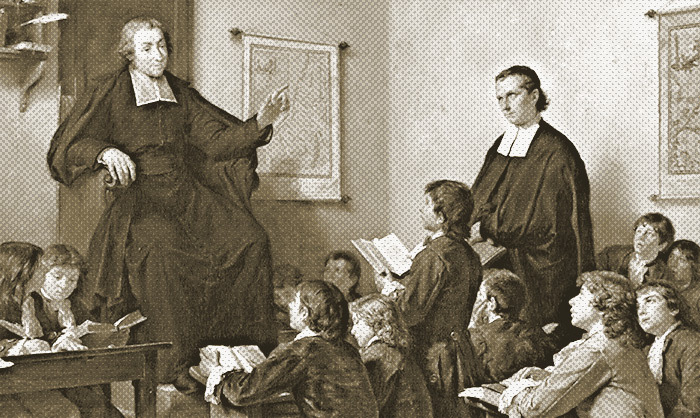 Founded by St. John Baptist de La Salle in 17th century France, today approximately 5,000 Brothers and 80,000 Partners serve nearly 900,000 students in about 1,000 educational ministries located in 80 countries. The Brothers of the Christian Schools is the largest religious order of Brothers in the Church dedicated solely to the mission of Christian education. The Institute’s headquarters, Casa Generalizia, is located in Rome, Italy. After 300 years since the death of Saint John Baptist de La Salle, the Institute he founded has been blessed with 13 Brother Saints (after the Founder), 7 Saints among alumni and affiliated members of the Institute, 151 Blessed Brothers, 12 other Blesseds among our alumni and affiliates, and 9 Venerable Brothers. The Lasallian Region of North America (RELAN) is one of five global regions served by Lasallian ministries. It encompasses the United States and Canada, and contains four Districts: District of Eastern North America, District of Francophone Canada, District of the Midwest, and District of San Francisco New Orleans. The Region contains a network of 7 colleges, 53 high schools, 19 middle schools, and 3 elementary schools, as well as a number of youth care facilities, residential and day treatment programs for special educational and behavioral needs, retreat centers, after school programs, and summer camps. The Region’s headquarters, Christian Brothers Conference, is located in Washington, D.C. The District of San Francisco New Orleans was established on July 1, 2014. It was created by combining the legacy Districts of San Francisco and New Orleans-Santa Fe, which between them had provided nearly 240 years of continuous ministry through their schools and other educational works. Today’s District includes 24 apostolates in eight states and Tijuana, Mexico, where over 115 Brothers and 2,000 Lasallian Partners serve more than 21,000 students. The District’s headquarters, De La Salle Institute, is located in Napa, California, with a second office located in Covington, Louisiana. Follow in the Footsteps of St. John Baptist de La Salle here. Discover the Institute of Brothers of the Christian Schools here. Explore the Lasallian Region of North America and other Regions here. Read the Stories of the Districts of New Orleans-Santa Fe and San Francisco here.